Comic book film Scott Pilgrim vs The World came out in the UK yesterday. Starring Michael "Arrested Development" Cera, it's a high-calorie energy blast of eye popping action movie mayhem - but with a soft, tender underbelly. If you grew up in the 80s and owned a Sega Mega Drive, this film is for you. If you didn't, it's still worth checking out. Over at the BBC, I've put together an intricate, 11-panel comic strip showing how the graphic novel was lovingly and faithfully translated to the big screen. Please click on this link to justify my existence. And, for those of you who are interested, I've posted the full transcript of my interviews with director Edgar Wright and stars Michael Cera and Jason Schwartzman "after the jump". Was the film as much fun to make as it is to watch? It was a lot of fun to make. I had an amazing cast and a great crew as well. It was definitely a marathon, so it was definitely exhausting at times. But the material was really good, the actors were really funny, and the music was really great. How long was the film shoot? Six months - at least twice as long as my previous film, Hot Fuzz. But I think that, hopefully, if you see the film it is quite evident that we shot for that long, at least I hope it looks like a lot of work up on the screen. How difficult is it to plan something like that? You just have to be really prepared. Right back from Shaun Of The Dead, I’ve tried to be really responsible with a budget and a schedule, and try to get the maximum out of that. So I just try to come to work really prepared. You went through the bootcamp with the actors. Are you pretty handy in a fight? No but I did get in good shape, briefly, just before we started filming! I worked out with them every morning for eight weeks. It was a good bonding exercise. I wanted to show solidarity, and I wanted to make sure they didn’t skip any sessions! With a film this stylised, did the studio get worried? Were you asked to change anything. The opposite, actually. They were kind of blown away by what we were shooting and, you know, I’d laid it out completely beforehand. They had the storyboards for the whole thing, so there was nothing that was a surprise. You first came across the graphic novels around the time of Shaun Of The Dead. At that point the story hadn’t been finished. What did that mean for you as a filmmaker? I just stalled until there were more books! I started working on the script five years ago, but then I made Hot Fuzz in the interim. And then there was a very long and painful writers’ strike in the US. So by the time we started filming, five books had been published, and then the sixth one was written but not drawn. Does your script adhere to the final book? The books and the film diverge sort of at the half-way mark, but we stay very true to the spirit and the tone. And, yeah, it’s very much in the same spirit as the books. They have slightly different endings, but it’s the same eventual outcome. The one-line concept is “Michael Cera has to fight his new girlfriend’s seven evil ex-boyfriends”. Is there any more to it than that? A big part of the books is that the relationships are as important as the action scenes. So it’s been about getting the right balance between those two. The high concept is that it’s about him having to fight his new girlfriend’s seven evil exes, but the irony is that Scott Pilgrim is a flawed character himself, and he has a past and he has exes that he hasn’t come to terms with yet. So it’s as much about him sorting out his baggage as much as it is about fighting hers. The US box office maybe wasn’t what people had hoped. Do you think this is a film with longevity? I mean, I don’t really buy into that stuff too much. I find it strange that people want to write the epitaph after 72 hours. I’ve worked on a bunch of things like Spaced and Shaun Of The Dead that had to percolate for a while before they found their audience. I’ve had such a strong response to this film already that I don’t doubt that it’s going to get out there. To me, I’m just proud to have something that’s really unique in the cinemas. And I’ve never had a film in the top five before, so I don’t care! 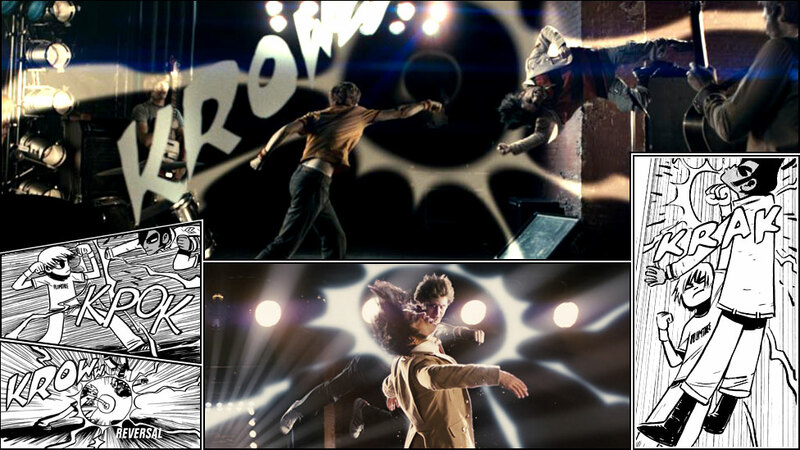 Scott Pilgrim is an incredibly stylised film and I imagine it was impossible to know what the finished product would look like while you were on set in Canada. What did you think first time you saw the final edit? Michael: I remembered every single moment. I remembered shooting everything in the movie that’s in there, and it’s incredible to see it work together. It’s incredible to see what Edgar was trying to achieve the whole time, and seeing the flow of it, and seeing what control he has as a film maker. I’m guessing from the tableau in front of me [see picture above] that the two of you became very close during filming. Michael: This would be a great painting, literally. I’d love to have a painting of just this. Jason: If there are any artists watching and they have the ability to freeze-frame this moment we’d love to get a painting of it, or something embroidered. How did you psyche yourselves up for your fight scene? Jason: I’ll tell you one thing. The most intense thing about doing a fight scene was how long it took. Because it wasn’t just a day or two of blasts of energy and then it was done. It was almost a month of constant work. That was surprising. The thing that I most enjoyed about it was how mentally fatiguing it was. Because although your body gets tired, you can’t let your mind get distracted – because we really have to rely on each other. They weren’t real metal swords, but we could really hurt each other – and we’re really attacking each other – and if I forget one of the moves because I’m exhausted, I could really hurt him or vice versa. That was one of the best things about it – the mental discipline that it took to get through it. That took the most psyching up. You said it was a month of constant work – were you filming it in stop-motion? Jason: There were so many... We never shot the whole fight scene start to finish. We shot it in what Edgar then told me is the Hong Kong style, which is to break down the fight into a series of beats, almost like dance choreography. And Edgar knew exactly what he needed from each camera angle. So we only shot those angles, and nothing more. We literally built it shot by shot, as opposed to just shooting a bunch of angles and editing it together later. It was basically already edited, and we were basically plugging in and getting it. So that was a really interesting way to work. And it really helped us be able to really hyper-focus and maintain the moves and get them right. You’re both known for your abllity to improvise, but there doesn't seem to be a lot of opportunity for that in this film. How did that affect your approach to the acting scenes? Michael: It was different. There wasn’t a lot of improvisation in this film because the script is so nuanced, and there are pay-offs later on in the movie that relate to dialogue from earlier. So it was very intricately written, so to improvise would be trodding on that. And also it was so stylised that the dialogue really fits into the vision and the style Edgar was going for. Jason: There’s a real speed to the movie and it has to be almost exactly timed – like there’s a metronome going tick, tock and it has to stay in time with that metronome or it’ll feel strange.